Do fancy signs sell homes better than traditional signs? Sellers often ask if they will get one of those “fancy” sign post signs that create a four inch hole in their yard versus a more typical sign with an integrated metal stand. Signs are for wayfinding. Not billboarding. The modern homebuyer shops for homes online first, then they get in the car drive to check out the area. Signs serve as confirmation they’ve found a house that’s on the market for sale. Signs should not be used by agents to promote themselves. If sign style doesn’t matter, does the content on the sign matter? Yes! Too many agents fall into the trap of more is better and clutter their signs with text codes, QR codes, 800 IVR numbers, slogans, and photos of themselves. Why agents feel a need to put their photo on their signs is another topic entirely. Suffice it to say, our industry is too self-absorbed. Instead of focusing on ourselves as the agent, we should be focusing on the client and their experience. The cluttered look of many real estate signs is confusing and unprofessional. A smart sign is clean, simple and has a single phone number and easy to type website for more info. The best websites are less than 10 characters long. A great example is pathpost.com, which is much easier to type on a smart phone than searchhomesinmetroatlantawiththebestagentintheuniverse.com. The experience that comes next is what truly matters. A mobile responsive website with a clean user interface. Map based search to see the surrounding areas. The ability to touch a button and call for more info. 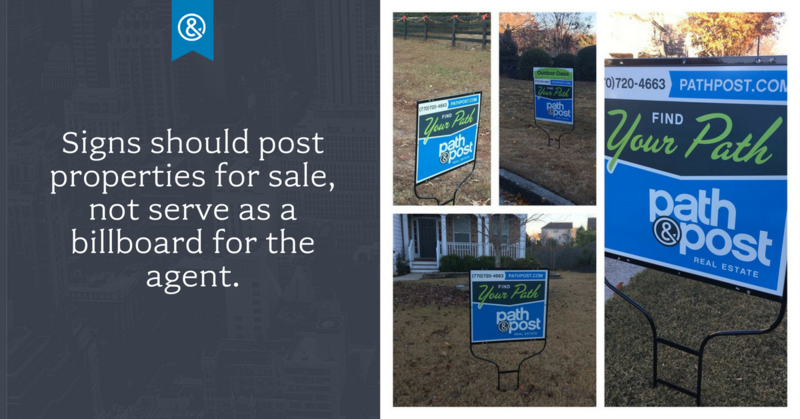 The style of sign post doesn’t help sell homes. Features, condition, location, and price sell homes. “Fancy” signs are often more about the agent trying to promote themselves for future business rather than spending money where it matters to market your home to reach the maximum number of buyers via the internet.